Every day along the halls of the Islamic high schools where we teach, teachers and students alike express admiration for our headscarves (henceforth referred to as jilbabs, the Indonesian word). Under our program’s rules, schools cannot require us to use the jilbab, but anyone can understand subtle encouragement, even if it is masked in Javanese politeness. That being said, our decision to wear the jilbab was our own choice and we have never regretted it. However, receiving compliments is not why we decided to wear headscarves. So why do we do it, if not for beauty? At the beginning, deciding to wear the jilbab was a surprisingly easy choice. Of course, the jilbab has a different significance for us than it does for a Muslim woman, but who is to say one significance is better than the other? Humans construct symbolic meaning both internally and socially, and the jilbab can take on different meanings depending on one’s perspective. To us, wearing a jilbab means that we are immersing ourselves completely in the culture by willingly adapting our own personal wardrobe to fit in with the standards of our school and our community. Some people may think it is odd or even offensive for non-Muslims to wear a jilbab. However, we wear the jilbab out of respect, not mockery. Our coworkers appreciate the gesture, our students feel more comfortable with it, and for us it is simply a uniform – nothing more, nothing less. The few other non-Muslim teachers at our schools also wear jilbabs, and some Muslim students and teachers only wear their jilbabs at school. We would never want to act like we are above school expectations, and besides, showing our hair would make us stick out more than we already do. Our fellow teachers have even taken it upon themselves to personally expand our jilbab collection, which we understand as further validation of our choice to wear it. Though Semarang is a big city, it is rare to see a woman without a jilbab. When we see the occasional ponytail blowing in the breeze on the back of a motorbike, it is worth a double-take. 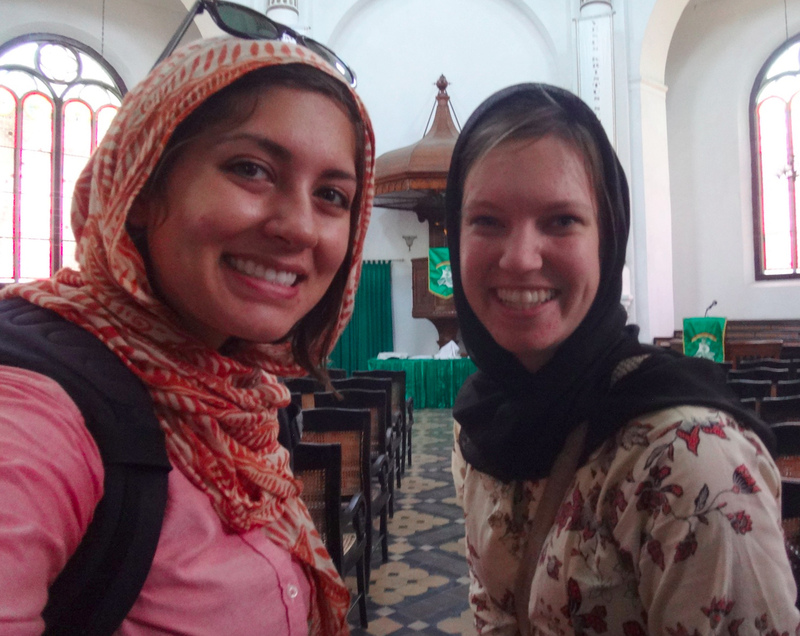 At first, we wore the jilbab everywhere we went, but then realized that might be excessive. To clear up any misunderstandings about our religion, we decided a strict no-jilbab policy outside of class would be appropriate. Plus, letting our hair down lets us hold on to a little bit of our own personal identity when we are outside of school, no matter how bad it looks after a day under the jilbab (a condition which we refer to as “jilbab-hair”). Still, people we see outside of school can now barely recognize us without it, although luckily our white skin helps identify us pretty quickly. Aside from the obvious benefits and drawbacks of a jilbab (built-in solution for a bad hair day versus profuse sweating all the time), it has been an overall positive experience for us. Within the jilbab world, we have also found our own personal styles – for example, letting a little bit of our hair stick out at the top (what scandal!). One of our friends says this is a “non-Muslim” style of wearing a jilbab, so we think it helps defray some confusion about our religion. We do need to frequently clarify that we are not Muslim, though, which has never been a problem. Our biggest complaint would be the heat. To any inventors out there: we wouldn’t mind if someone created a built-in air conditioner for the jilbab. No matter how silly we think we look with a scarf draped haphazardly around our heads while beads of sweat drip down our faces and neck like the floods of rainy season, teachers and students genuinely mean it when they tell us we are beautiful while wearing the jilbab. It dawned on us that we had been indoctrinated all of our lives with an entirely different concept of beauty than our fellow teachers had. We saw the same image, but we perceived it in different ways because our respective cultures had given us different frameworks for understanding the world around us. To us, the jilbab made us look like sweaty, post-pubescent Little Red Riding Hoods. To our Indonesian friends, it made us beautiful. The philosophy behind the jilbab seems ideal for women. According to The Religion of Islam website, “Jilbab frees women from being thought of as sexual objects of desire or from being valued for their looks or body shape rather than their minds and intellect.” Still, we are constantly told how much more beautiful we are with the jilbab. Donning a jilbab creates an interesting paradox: though we wear something meant to defray the attention given to our outward appearance, everyone constantly tells us how beautiful we look with it. As non-Muslim women, we can’t say whether wearing the jilbab is right or wrong. We simply felt that this was the best way for us to adapt to our new environment and to immerse ourselves in the new world around us. And, as time goes on, our interpretations are changing. Perhaps seven months from now we may have a new perception of everything. Until then, to jilbab it is. About the authors: Emily Kay Denny and Amelia Murphy are Fulbright English Teaching Assistants and sitemates in Semarang, Central Java. Emily is a Colorado-native who graduated from the University of Denver in 2012 with a degree in Political Science. In her free time she enjoys flossing, reading the news, singing off-key karaoke, trying to convince everyone that Semarang is the “Bali of Java,” and making up hobbies so that her students don’t think she is lame. Amelia graduated from Smith College with a degree in Psychology and Italian Studies. She can be found running around her neighborhood through the banana trees in search of the most delicious (and butter-filled) dessert in Indonesia: kue Bandung. Interesting! I’m also American but I live in Jogja and I teach at UGM. When I was teaching in Solo (a more religious city), I thought about wearing a jilbab to work too. I also really appreciate your comment at the end about the “paradox” of wearing a jilbab. There was one time I was hanging out with my Indonesian guy friend, and he saw a group of women wearing black burkas, and the first thing he said was, “Oh wow, those women must be so beautiful! Their skin must be so white” etc. I gave him a funny look and we had a interesting conversation about this “paradox” of the jilbab or burka being the veil to hide outer beauty, yet inevitably making people think about the woman’s appearance. Anyways, you go girls, and I’m glad you’re enjoying Semarang! PS – maybe we should meet up sometime! I knew a Fulbright near Jogja last year too 🙂 Selamat jalan! Jilbab frees women from being thought of as sexual objects of desire or from being valued for their looks or body shape rather than their minds and intellect.” How covering your hair helps that? Pretty fun to see how things are turned around and make seems is good for woman, when notoriously they arent kept in much consideration in some muslim countries.. I disagree that wearing a jilbab “frees women from being thought of as sexual objects of desire.” What frees women is when men stop thinking of women as sexual objects, and no bikini or jilbab is going to achieve that. It shouldn’t be solely up to the woman to don something that will prevent them from being thought of as objects instead of people. And I doubt that is the only reason Muslim women wear a jilbab. Finally, what are the cultural/reputation consequences of you taking off the jilbab, vs. the consequences for your students? Great point. I (Amelia) agree with you. I’m not entirely qualified to answer your last question, but I can tell you that, as Westerners, we have a certain “wild card” that allows us to do things without judgement that a native Indonesian may not be able to do. Some students at our schools certainly take off the jilbab after school, but we’re not sure what repercussions this may have on their reputation, as wearing the jilbab is pretty ingrained in the culture here. As far as consequences for the students if Emily and I taught without the jilbab, I think the students would feel less comfortable working with us in the classroom. Wearing a jilbab gives us some credibility and it shows we respect the school’s dress code. What a fantastic blog! I totally understand your reasons for wearing a jilbab (kerudung) and ‘take my hat off to you both’ as while I have also considered it purely for reasons of respect, I haven’t done so for several reasons. I have taught in Kalimantan, Java, Bali and West Papua and at each school, staff and students have commented on how much they appreciated my long skirts & batik long sleeved shirts. At times I have felt very conspicuous with my uncovered hair, but haven’t worn a kerundung (no way would I wear a jilbab) mainly due to the heat but also because at each school I have taught at, Christian students are a minority, so I always hope that my presence at their schools helps to raise their profile and religious credibility which is generally dwarfed in Indonesia (except for Flores, Timor etc)! interesting point of view.. for a muslim woman, hijab is actually not an option, it’s an obligation, just like shalat (praying 5 times a day). But in Indonesia, religions and culture are often collide and create a blurry wall. We won’t force someone to wear jilbab, even if she’s a muslim. In Indonesia, wearing jilbab nowadays are truly depends our own calling..